In this case, “voter fraud” would mean that we have people who are either not citizens, or dead people, or people that vote multiple times here in Texas. We’ve been told this just doesn’t happen, so what’s the problem with letting Trump’s commission determine that for themselves? Shouldn’t that put the urban legend that there is voter fraud in Texas to bed once and for all? Shouldn’t we be happy to see Trump be proven wrong, when his team discovers that ZERO legal residents are voting, that ZERO undocumented immigrants are voting, that ZERO dead people have cast absentee ballots from the hereafter, and that ZERO people from Texas have voted multiple times, in multiple jurisdictions? Why would we not want to see one of Trump’s pernicious lies be debunked….by his own people? Because Trump will never admit it is a nothing burger. He will say whatever he wants, true or not, and some number of people will believe him. That’s his prime directive. If a Democratic administration requested this information, Republicans would claim it was a conspiracy to round up all the guns. Bill, guess what? Election systems are run by human beings; therefore 100% accuracy is not likely. Why do you harbor such obvious doubts about the competency and dedication of Texas election officials and their staffs? The President has made careless allegations about the competency of dedicated offices throughout our country. They are not afraid if his so-called investigation and are very accustomed to outside scrutiny and receiving flak from the entire political spectrum. The incompetence of this commission is already evident by their ignorance of State laws and inability to guarantee security of this data. Your faith and trust is misplaced. Bill, I agree with you, but Texas is not 100% supportive because about 20% of Republican voters are voting from the grave, they be dead voters. Why would it be at all believable that there are substantial numbers of non-citizens in the registered voter rolls in Texas? Are we to believe that the party that controls the entire state government has some sort of vested interest in retaining those non-citizens as registered voters? How can anyone willing to pass detailed information about individual voting practices coupled with personal identifiers to the federal government for an investigation believably claim to be libertarian? You know what bothered me, as a Libertarian? One year, I go renew my driver’s license and they demand my thumb prints. I’m no criminal, and didn’t serve in the military, where there’s a legitimate need for that to ID dead soldiers, and I’m not applying for a top secret clearance job. I’m just a citizen who wants to drive. Next time? Give all 10 fingerprints or take the bus. I’m also bothered by the government’s warrantless, no probable cause, listening to my phone calls, reading my faxes and e-mails, all proven by Edward Snowden. What happened with that? Clapper perjured himself under oath denying it, and then…..nothing. I have to assume that illegal spying is still going on, even under Trump. As to giving personal identifiers to Uncle Sam? Uncle Sam not only HAS all my personal identifiers, it issued most of them in the first place. The cat’s out of the bag already. Getting the voter names with the last 4 of the Social Security is the fastest way to confirm that the voter is indeed a citizen, and is not registered in multiple jurisdictions. Even Texas gave DL’s to the undocumented, and when you combine that with “motor voter” policies, it’s very possible that we might have undocumented, and especially green card holders who are on voter rolls. It should also be very easy to confirm that people who die are promptly removed from voter rolls. Then I’ll put you down as supporting this double checking of voter rolls, because it will benefit you, getting dead Pubs off the rolls and getting them to stop voting. Don’t you think those dead Republican voters are voting by absentee ballot, probably filled out by living family members? I know you want to put a stop to that. This is how we do that. So Bill, how many John Smiths with last 4 of SSAN of 3872 do you think there might be? The Trump commission is a complete waste of time, especially checking for registration in multiple jurisdictions, since I doubt that Texas tells, for example, Illinois when someone moves. Bill, why are you assuming that nobody is double-checking voter rolls. In your mind is it that a public office is necessarily incapable of performing the multiple tasks required to maintain the rolls? Why are you assuming that a DC commission is going to somehow perform this in a better fashion than the local and State offices do? And that’s disregarding all the other issues at work here. Why do you assume State and local offices are incompetent and/or negligent? I’m not saying that you aren’t fighting the good fight, doing your best to protect the integrity of the voter rolls. I’m saying, why not take advantage of outside help to confirm what a good job you are doing? Who doesn’t appreciate a pat on the back for doing a good job? Finally, I’ll just ask this question. If President Hillary had created the same oversight agency, would we all still be vehemently against this? @Bill, I would be just as opposed if Hilary had tried the same thing. Bill there are many many people registered in multiple places. If I were to move to Travis County and registered to vote there a year later I move to Bexar County and registered to vote there I would be registered to vote in three places. I can only vote in one, what I just stated is very common. There is no requirement that I notify the county that I have moved and it would be illegal to vote in Harris County if I voted else where. In times my name would be perched because of inaction but it takes years for that to happen. Texas knows that there many Republicans voting from the grave and what they and Trump do has nothing to do with that that is why they always target big Blue cities. Several lawsuits here in Harris County about removing names in the past. If I lived elsewhere, which is also very common. Lot of Pearland and Woodland folks vote here. How do the hundreds of thousands of Texans who don’t have a TDL or I’D card register to vote in the first place? They probably don’t have a SS card either. You only report the SSN on the application; you don’t have to produce a card. There may be citizens without a SSN. If so I have no idea what their options are. Voter, that may be true, but there are many people living elsewhere that vote in previous addresses as long as they don’t update their license. I do admit that I have not kept upwith how well Texas handles those changes, Thanks for the info, but what happens when they move out of state, Trump’s daughter and his son in law are or were registered to vote in two states. There may be millions like that. Trump’s expert on voter fraud was registered to vote in three states. Is being registered to vote in more than one place a crime? Or is it only a crime if you vote in more than one place? Just for grins, I looked up the application form to register to vote. You can check a box that says you don’t have a TDL, a TX ID card or a SS #, and that doesn’t disqualify someone from getting registered. 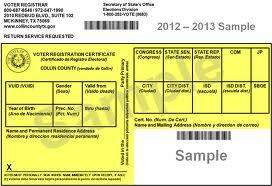 I’d like to know how many people here in Texas don’t have a SS, TDL or TX ID card that are indeed registered to vote. Bill, I’d suggest inquiring with the SOS Election Division to start with, if you want the question answered by the agency that would have the data. DT is spending “our” money foolishly on this farce only to determine in his sick mind that Hillary did NOT win the popular vote which is NEVER going to happen. Impeachment is near ! !